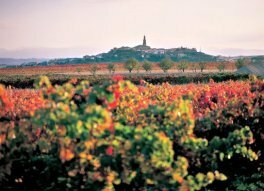 When the acclaimed French chef Paul Bocuse was asked to prepare a banquet for the hundredth anniversary of a famous winery in La Rioja, he shared this dish with the kitchen staff and apparently requested a second and then third serving for himself! Even when made with chorizos produced in the United States, it is delicious. Peel the potatoes. To “crack” the potatoes into chestnut-sized pieces, make a small cut in each potato and then break it open the rest of the way. Set the potato pieces aside. In a large saucepan, heat the olive oil over medium heat. Add the onion and garlic and sauté for 10 minutes, or until softened. Add the chorizos and cook, stirring, for about 1minute. Add the potatoes, pimentón, red pepper flakes, and salt and stir to mix the ingredients. Add water to cover by 1 inch and bring to a boil. Cover, decrease the heat to medium-low, and cook slowly for 30 minutes, or until the potatoes are fork-tender. Remove from the heat. Mash a piece or two of the potato against the side of the pot with the back of a spoon to thicken the soup. Stir once, re-cover, and let stand for 10 minutes. Stir again, ladle into warmed bowls, and serve immediately. 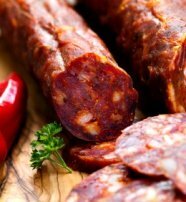 Chorizo: Every household in Spain has at least one or two of the hundreds of varieties of delicious chorizo sausages. The origins of this spicy sausage are quite old. There is documentation of the Roman praises of this product. The ingredients used to make it are lean pork, pork fat, salt, pepper, paprika, garlic. oregano and thyme.